President Trump claims his proposals would balance the budget in 10 years. Under his blueprint for next year, the federal government would take in more than it spends by 2027, according to White House estimates. You'd think independent fiscal hawks would be ecstatic. They're not. That's because Trump's balanced budget is built on unrealistic assumptions -- not to mention proposed spending cuts that would largely come at the expense of the poor, the disabled and children. 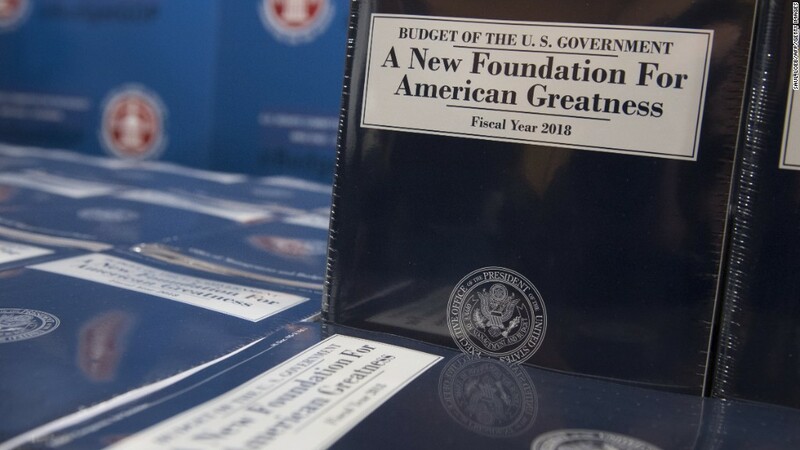 The White House Budget Office assumes sustained 3% economic growth starting in 2020. That would top the economic growth of the 1990s, according to the Committee for a Responsible Federal Budget. The Congressional Budget Office, by contrast, assumes average real GDP growth of just 1.8% over the next decade. Private sector forecasts are also lower than the White House estimate. "While it is certainly possible to attain above-trend growth in any given year, it is not fiscally responsible to base a budget on the assumption that such growth can be maintained permanently," said Robert Bixby, executive director of the Concord Coalition, a fiscal watchdog group. If CBO's growth rate were plugged into Trump's budget, it would still produce a deficit in 2027, according to CRFB's analysis. Trump has touted tax reform with big tax cuts as key to his economic agenda. And analyses of his prior tax proposals and his latest tax reform outline find that his ideas would result in big, expensive tax cuts, the direct benefits of which would flow disproportionately to the highest income Americans. Despite evidence to the contrary, the administration assumes that those tax cuts would pay for themselves in full through the economic growth they would generate. In other words, more growth means more revenue, and that revenue would offset any initial revenue loss from the tax cuts. But the budget appears to use the revenue from growth to pay down debt while also assuming that Trump's tax reform will be revenue neutral. "The same money cannot be used twice," the CRFB has noted. Former Treasury Secretary Larry Summers was more biting. "You can't use the growth benefits of tax cuts once to justify an optimistic baseline and then again to claim that the tax cuts do not cost revenue. At least you cannot do so in a world of logic," Summers wrote in an opinion piece for the Washington Post. Current Treasury Secretary Steven Mnuchin, in an interview at the Peterson Fiscal Summit, downplayed the issue, saying the president's budget is "a preliminary document that will be refined as we go through the process of working with Congress determining how money is spent and working with the House and Senate on taxes. Ultimately the numbers will be completely transparent." Republican efforts to repeal and replace Obamacare have been snakebit. After months of controversy and division, the House passed a widely disliked bill, the fate of which now rests in the Senate. Everyone expects the bill to change a lot, if not completely, by the time the Senate is through with it. But the Trump budget assumes the House bill -- with its more than $800 billion in cuts to Medicaid -- will be passed into law wholesale. The White House estimates that the country's cumulative debt as a share of the economy would fall to 60% of GDP by 2027 under Trump's proposals, down from 77% today. Most economists and fiscal policy experts have called for lawmakers to slow growth in the country's debt, because if they don't the budget will soon become unsustainable as the population ages and health care costs rise. But they typically recommend two things: Focus the bulk of the changes on the programs that are the primary drivers of debt: Namely, Medicare and Social Security. And don't let the burden of any tax increases or spending cuts fall too hard on any one group, while protecting the vulnerable. Trump's budget pointedly doesn't touch Medicare and avoids Social Security's retirement program. As for sharing the burden, the Trump budget ax would fall pretty heavily on programs benefiting low-income Americans, as well as average Americans who benefit from nondefense domestic programs for which funding would be cut by 2% every year. "The proposed budget reduction fails the test of broadly shared trade-offs and sacrifices," Bixby said.